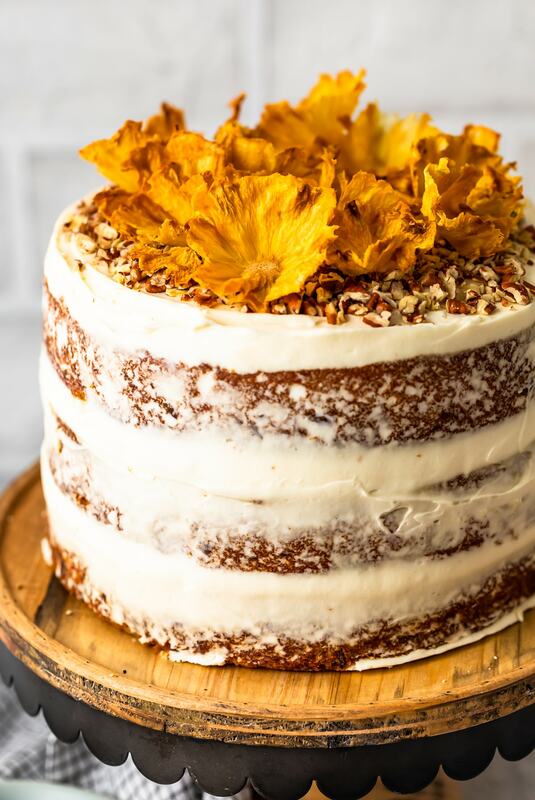 Dried Pineapple Flowers are a surprisingly easy way to make any cake look like it was decorated by a professional! Learn how to make flowers for cake out of pineapple, and every cake will look extra amazing for holidays and special occasions. Plus these dried pineapple slices make a great snack! 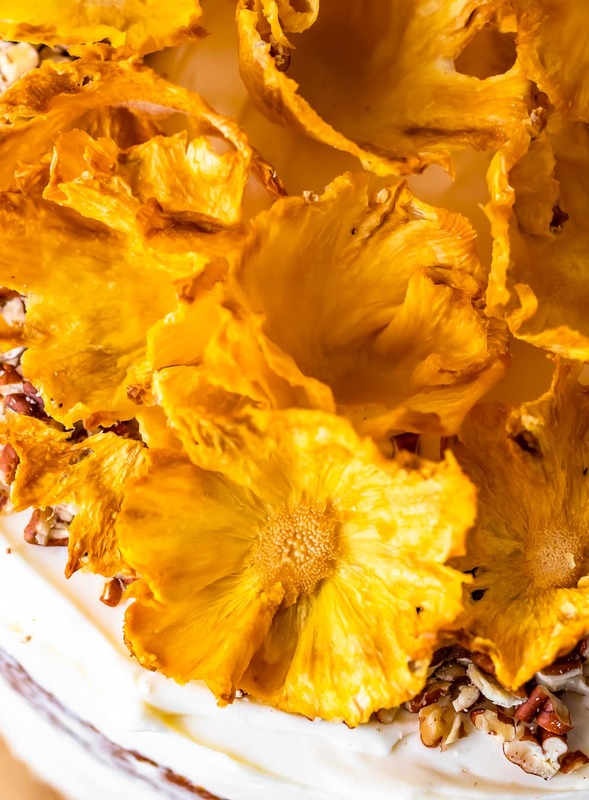 These BEAUTIFUL dried pineapple flowers are the perfect way to top off your favorite cakes. Easy to make and they look so fancy! I’m not usually a baker, and definitely not a cake decorator, but I went all in on this one. 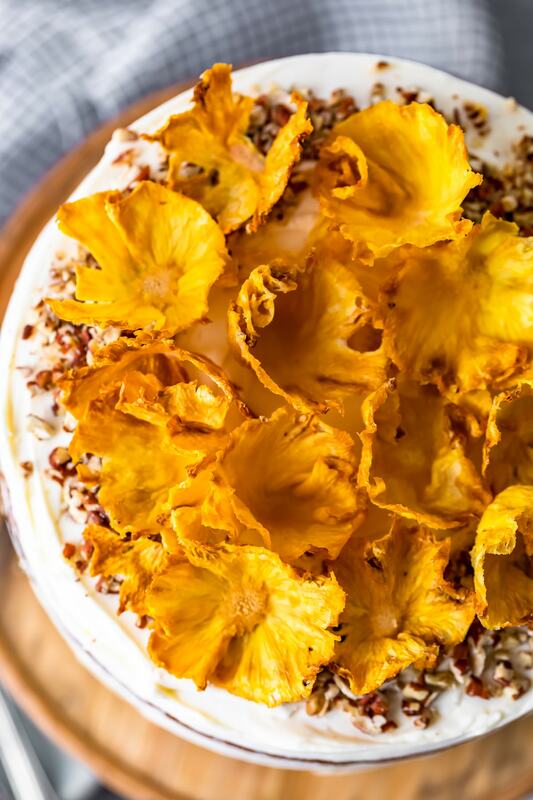 These pineapple flowers were just the thing to finish off my pineapple banana Hummingbird Cake. I’m surprised by how easy it was to make flowers for my cake out of pineapple. Just bake the pineapple slices to dry them out, then shape them into these little flower shapes, and voila! You can place them on top of any cake, cupcake, or dessert for a little extra pizzaz. 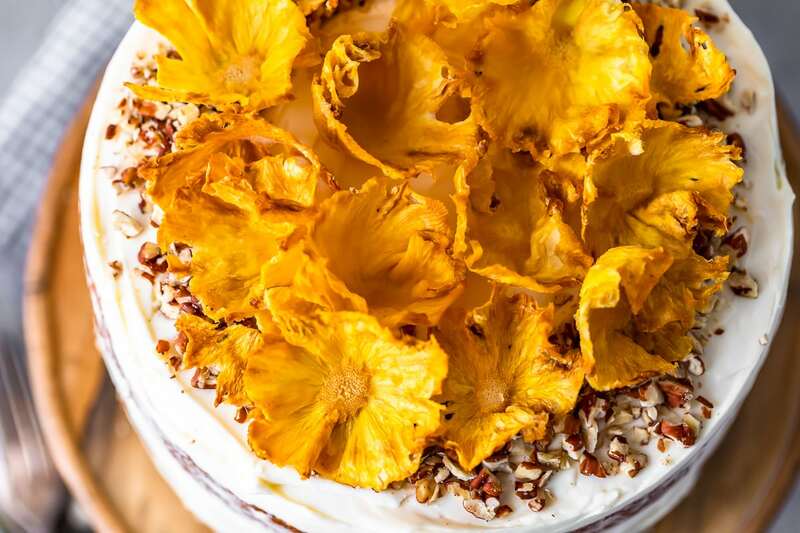 These dried pineapple flowers will impress everyone, and make you look like a professional cake decorator! They also taste great and work as a simple little snack. 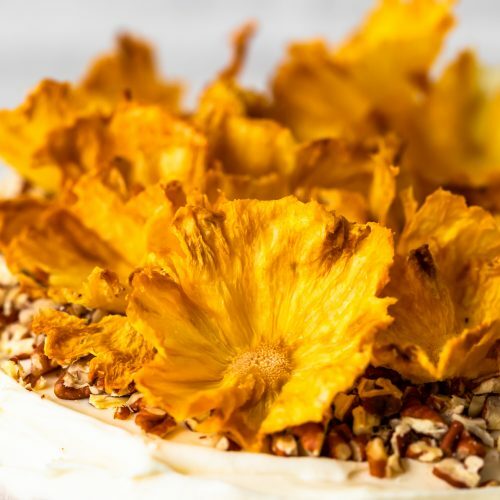 Make all your cakes a little extra special with these easy Dried Pineapple Flowers. Simple to make, beautiful to look at, and delicious to eat! 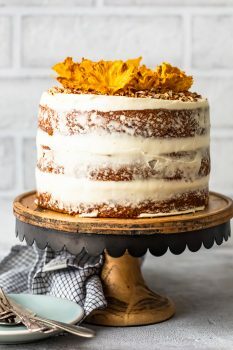 I made these pineapple flowers for my Hummingbird Cake, and they look so pretty! The delicious banana pineapple cake is a classic, and the dried pineapple slices were exactly what it needed for a finishing touch. You can use this method to make flowers for any cake, cupcake, or dessert you want. I think placing a single pineapple flower on top of a cupcake would be so cute for bridal showers or baby showers. It’s really an easy way to make any dessert look even more beautiful! Be sure to check out the Hummingbird Cake recipe for a special Easter dessert! Any kind of cake decoration seems complicated, but these are the exact opposite. All you have to do is slice, bake, and shape! They come out in this perfectly crisp texture that makes them hold their shape and look like ACTUAL flowers. So fun! Preheat oven to 200°F, then prepare the pineapple by cutting off the outside shell (do not remove the core). Now cut the pineapple into super thin slices. A mandoline will help you get the perfect paper thin slices. Use paper towels to dry the slices and remove as much moisture as you can. Place a cooling rack or baking grid inside of a baking sheet, and place the pineapple slices on the cooling rack. Set them in the oven for 2-3 hours at 200°F until they are fully dried and the edges start to look crisped. Carefully place each slice into small muffin tin cups to shape them. Let them cool completely to take shape. Now you can place them as you please on top of a cake or use them however you want! The secret about these pineapple flowers? In addition to looking really pretty on top of cakes, they’re DELICIOUS! Since they’re actually just dried pineapple slices, they make a really tasty and healthy snack too. 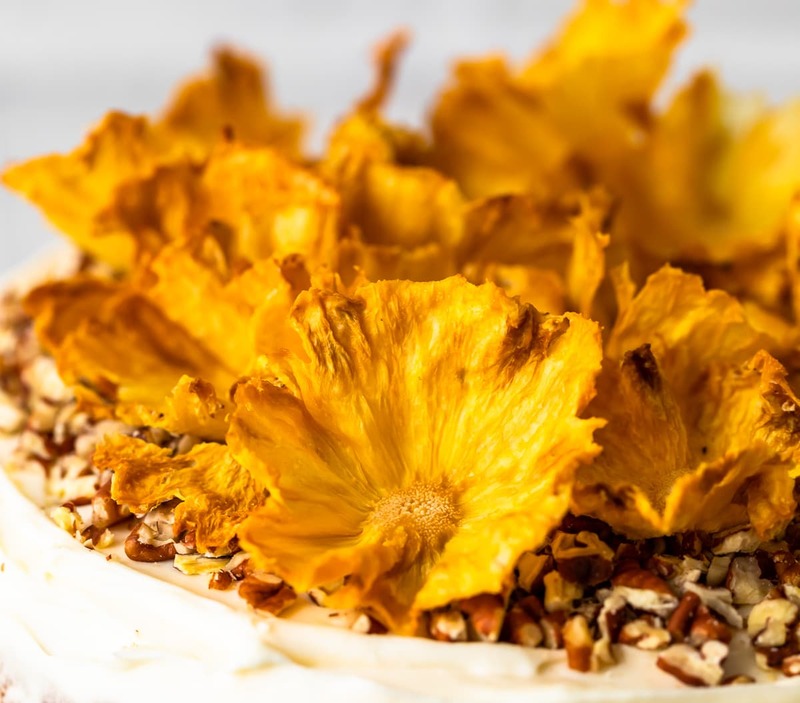 You can follow this same recipe to make dried pineapple chips for a snack or appetizer; just skip the part where you shape them into flowers (or don’t…nothing wrong with a fancy flower-shaped snack). Once they’re dried out, you can easily save them and eat them whenever you want. They’ll last quite a while in an airtight container or sealed bag. You could also add a bit of sea salt or cinnamon for a little more flavor. Yum! Whether you use these dried pineapples as flower decorations for a cake, or as tasty pineapple chips, I know you’re going to love them. They’re so simple to make and so fun to use/eat. 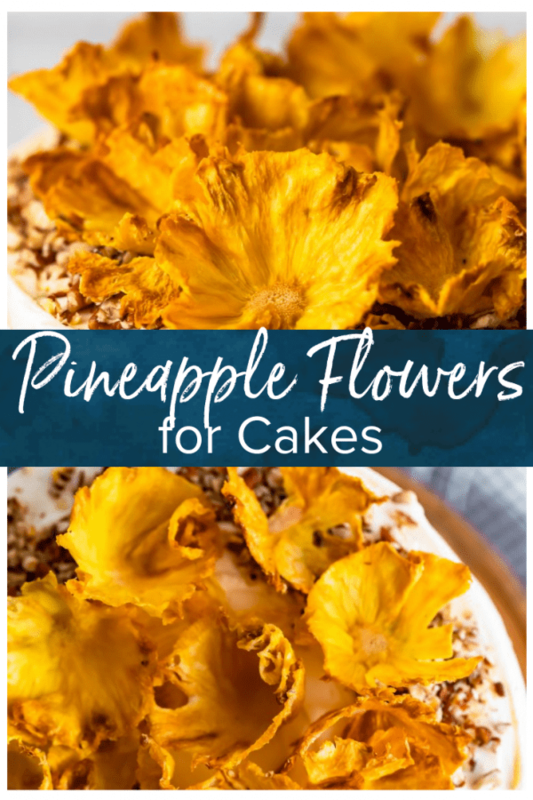 See the recipe card for details on how to make dried pineapple flowers for cakes. Enjoy! Slice pineapple into paper thin slices. It's best to use a mandolin slicer to get the slices as thin as possible. Dry each pineapple slice carefully on both sides with a paper towel, getting up as much moisture as you can. Lay the slices (again, be very careful!) on a large baking grid/cooling rack. Place the rack over a large baking sheet (so it doesn't drip in your oven). Place in the oven for 2-3 hours or until the slices are fully dried out and crisp on the edges as shown. While still warm, place each dried pineapple slice into the inside of a mini muffin tin or similarly sized small cup/dish to create the shape of flowers you want. Allow pineapple to fully dry in the muffin tin. Once dried, they'll hold their shape! 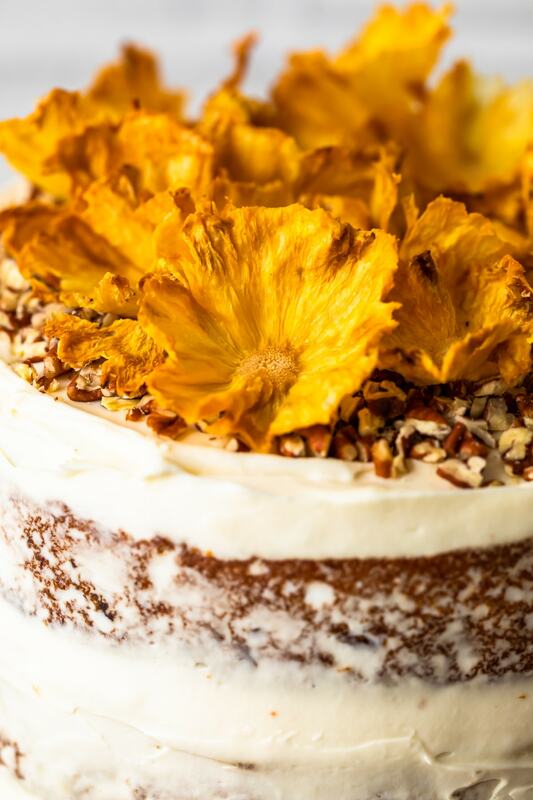 Place flowers on desserts such as Hummingbird Cake as garnish, or eat as a low calorie snack! NOTE: if you prefer to make these as an appetizer or snack, there's no need to form them into flowers. they're delicious as "pineapple chips"! These really liven up any cake! I love them as a snack as well. I love them as a snack!! These dried pineapples were GORGEOUS on my cake! And so easy! Who knew pineapple could look so pretty! I love that it is also a yummy, snack! I definitely need to add these to desserts! I never knew you could do this! They are so pretty!! Can’t wait to try making them! They’re so easy and pretty! 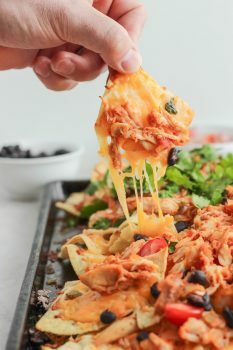 We make these all the time just for snacking….so good!